Easy-to-use CD/DVD/Blu-ray exact copy utility. ...... 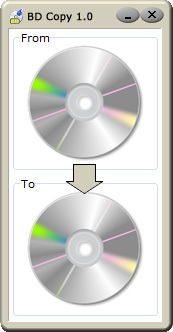 Bronze Disc Copy allows creating an exact copy of your disc with few mouse clicks*. Bronze Disc Copy is shareware ($19.95). You can download and try it before you buy. Registration includes free version upgrades and support. *Ideal for CD/DVD/Blu-ray backup purposes. Qweas is providing links to Bronze Disc Copy 1.0 as a courtesy, and makes no representations regarding Bronze Disc Copy or any other applications or any information related thereto. Any questions, complaints or claims regarding this application Bronze Disc Copy 1.0 must be directed to the appropriate software vendor. You may click the publisher link of Bronze Disc Copy on the top of this page to get more details about the vendor.